Can I have a moment of honesty? I was seriously considering NOT sending out Christmas cards this year. Gasp! No…shut your mouth! Last year, my husband and I overwhelmed our friends and families with pictures of ourselves (my sister has told me on more than one occasion that she’s tired of receiving pictures as gifts). Don’t laugh too hard, we got married…of course people want to see wedding pictures…right? Alright, maybe we I overdid it. The Bridal Portrait album, the Engagement Portrait album, the Wedding album and the Honeymoon album on top of Christmas cards with one of our wedding pictures may have been a bit much (actually, I think it was all fine until we had to watch the wedding video multiple times and my cousin’s boyfriend looked like he was going to be sick)…but I loved every minute of it. Throughout the entire wedding planning process, Shutterfly hosted our wedding website…although I doubt anyone read it. 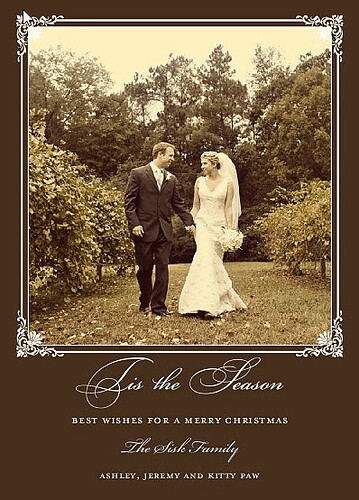 When Christmas rolled around, it seemed only natural to order our Christmas cards from Shutterfly. Unfortunately our card is no longer available (last year’s card is on the left), but I created a similar design with the same photo just to give you an idea. Since that time, I have done very little photo printing, but when I have had any of my photographs printed, I’ve always used Shutterfly…and I recommend them to my “clients” (or rather those brave enough to allow me to photograph them). 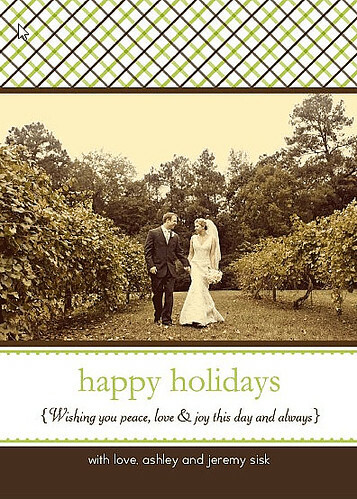 With all that said, it just makes sense that I will continue using Shutterfly for all my holiday greeting needs. Paw Humbug will be hitting a mail box near you soon! I think that says it all. I can’t wait to order my Christmas Cards…granted, it won’t be much of a surprise any more, but still pretty exciting. If you are interested in any of the above designs, click on the picture to be redirected to the product page. Disclosure: I am being compensated by Shutterfly in the form of greeting cards, however, I am committed to promoting products and services that I believe in…and that I directly use. If you are also interested in participating in Shutterfly’s current blogger promotion, click HERE. Let me know if you have any questions!